The first fortnight of February it was snowy, cold and gloomy and by contrast the last weekend of the month was gloriously warm and sunny with record breaking seasonal temperatures. On the Saturday (23rd), after failing to start, the Corsair was rolled out of the garage on to the road to be assisted with a jump start from the daily driver Passat. It took a while of turning over and by not using much choke the car eventually fired up. With the engine warming up there were no excuses left not to go out in the Corsair, so for the sheer fun of it, a drive was done on a familiar circuit. The A30 section to Barford St Martin was a bit slow following another motorist for much of the way, then I had trouble getting past a large, wide and bouncy tractor on the way to Dinton. Once past the big and bouncy tractor I had an open road (B3089) before me and a BMW Z4 coupe lurking in my rear view mirror. 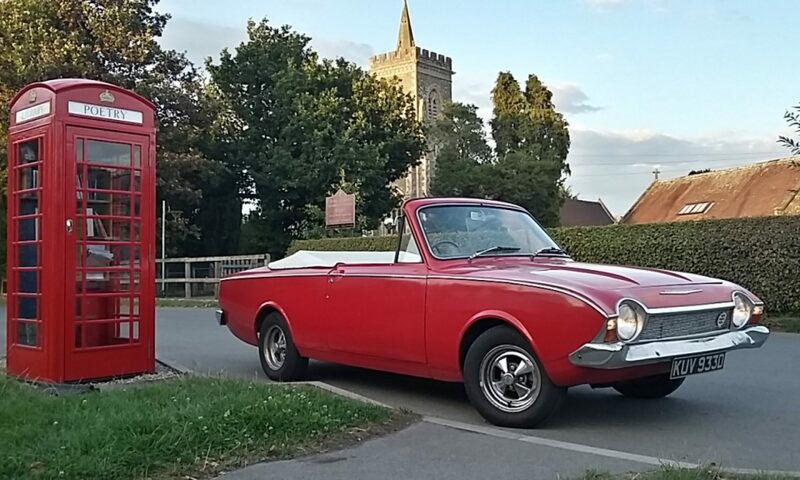 It made for a pleasurable swift drive passing through the villages of Teffont, Fonthill Gifford and Hindon with that BMW still contentedly following. Once at the traffic lights on the A350 I turned left to Shaftesbury only to join a quicker stream of traffic than I had endured earlier. The Corsair had been a bit tricky to start since it’s last outing to Blandford before Christmas. 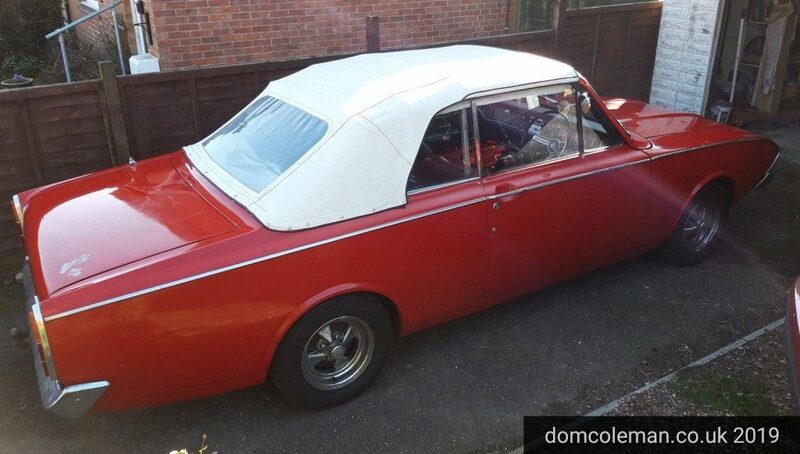 Unfortunately, it let me down on New Years Day as I had planned to go to a classic meet at Sturminster Newton but it failed to start and I drained the battery in the process. A couple of weeks later, with the battery on trickle charge, I tried it again and after several turn overs I just caught it enough for it to cough in to life on minimal choke and after several pumps of the accelerator (gas) pedal. It was a good start to the month with a run out to the Footman James Classic Restoration Show at The Bath & West show ground. The weather was gloomy to start with but brightened up by late morning and was very mild too. It was a smooth drive with a lovely brisk run from Gillingham on the B3081 towards Wincanton and then a clear run from the Hunter’s Lodge to the other side of Bruton. At the show ground in the classic parking, I was guided to a good central position. I put up my windscreen info board and then wandered off to the auto jumble for a browse. The Crayford badge that I had got as a recent present was painted and fitted around this time in time for the show. I think it will need a bit more work to look right, the black is a bit flat and the pewter metal work could do with more of a polish/buff. Plenty of interest was shown in the Corsair and it was pleasure to see people reading the info board and taking pictures of it. By 2 pm I decided to leave, but the trip back wasn’t as much fun with other traffic slowing things down. The engine still seemed a little flat in places at the low cruising speeds of around 34-45 mph and improved once average speed got to be over 45 mph. A later look at all the spark plugs showed them to be in good condition except for cylinder 2 that was a little coked up, so I’m not sure what to do about that. From there the weather for the month took a turn for the worst and the Corsair wasn’t to be subjected to the cold and wet – although when left for a while it was not keen to get started either. December rolled around all too quickly and nearly passed me by, but with a trip required to Blandford for pet food, a DIY shop and a supermarket and with the weather being dry and mild it seemed right to take the Corsair. It hadn’t been started for a few weeks so I had the foresight to start and warm the car up the day before, which took several attempts. Come the Saturday for the trip out, starting was much the same as the previous day, by catching the fire up after several turn overs and then increase the choke to raise the tickover. I stayed local first, delivering Christmas cards to family and the drive was fine although somewhat constrained by the compulsory 50 mph speed limits and other traffic. It was great to be behind the wheel after what seemed a while and put on those miles of smiles. 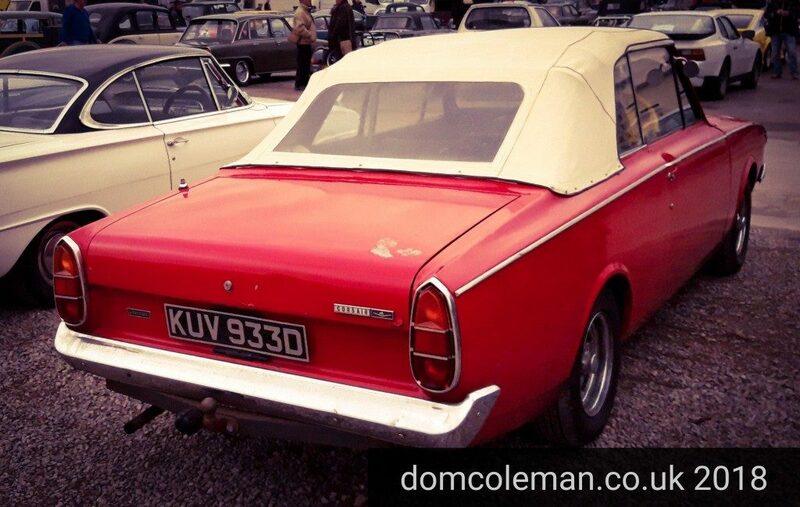 To start the month I took the Corsair to the Hampshire Capri Club meeting at the New Inn pub/hotel at Heckfield. Where the ‘heck’ is that? Heckfield is a small village off from the A33 between Basingstoke and Reading, just inside the North Hampshire border to Berkshire. 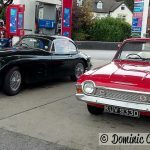 It therefore became 70+ miles each way journey for the Corsair, which drove fine with no problems and cruised happily at 60mph on the A303. I didn’t take it on the M3, opting to go through Basingstoke and negotiating the multiple roundabouts which wasn’t too daunting mixing it up with all the Sunday shopper traffic. I hadn’t lost my touch on the traffic lights either, successfully burning up a Fiesta on one occasion. The weather was glorious and warm but the hood stayed up as it was now in the winter mode (after a cooling off at the end of September) and will stay that way until after March next year. Corsair at the New Inn, Heckfield, near Basingstoke, Hampshire. Plenty of driving has ensued for the month of September. 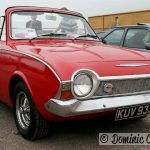 A visit to the Breakfast meet at Haynes International Motor Museum on the 2nd, two trips to my place of work (54 mile round trips), a drive to Gillingham and onto Sturminster Newton and another trip to Salisbury has put on the miles and smiles. Corsair at the top of St Annes Street, Salisbury with the hood down this time. Here is another video, this time with a former work colleague driving the Corsair back from his leaving do. I had a fortnight off work, so lots of opportunities for Corsair driving time. 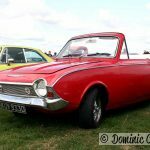 The first major trip was to take Nigel (Christmas Tipple post) and his son out one afternoon for a spin, so I took a familiar route down the A30 to Fovant and onto Barford St Martin and back via Dinton and Tisbury. The hay lorry over-take at Compton Chamberlyne was an exhilarating experience as well as a necessity due to the fact we were getting covered in hay as it was being raked off by the trees and bushes the lorry scrapped past. Once at Tisbury, I let Nigel drive the Corsair for the last part of the journey and he quickly had a feel for the car and the proper driving experience it provides. 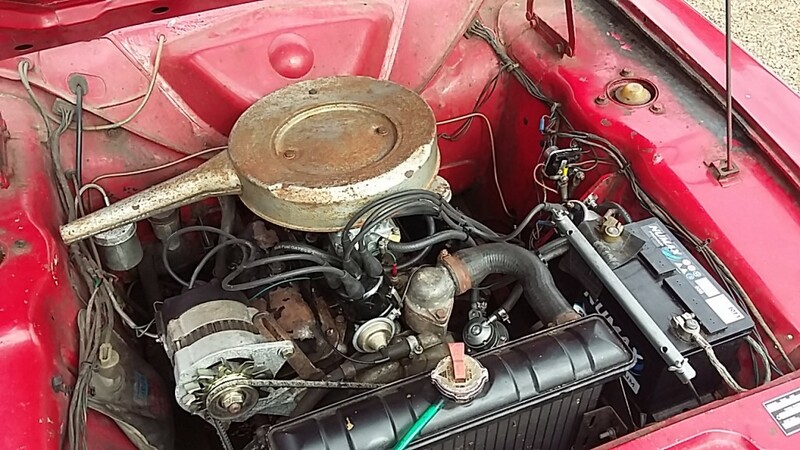 All was OK, on later trips, I traced the hissing noise from the engine as being a pin hole water leak in a core plug at the rear of the right bank cylinder head. The radiator water was rather low and since topping it back up it hadn’t dropped any more in about 150 miles. 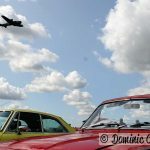 There had been several local trips out and about before I took it to a drive-in event at Henstridge Airfield for the Wings and Wheels day. The Corsair was well received especially as it was the only Corsair there and also because of it’s history. 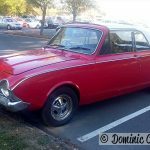 A week later it was a nice cruise down the A303 at a steady 55mph, but in the other direction, towards Sparkford to go to the Breakfast Club Meet at the Haynes International Motor Museum. 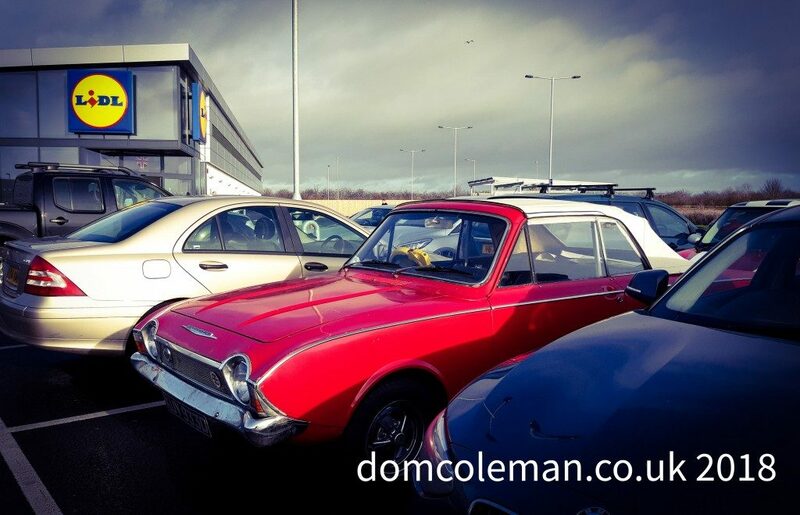 Once parked up, the Corsair drew some immediate interest for some former Seventies Ford mechanics and again was the only Corsair in attendance among the many hot hatches, Triumphs and Jaguars. A few more trips are planned before further work commences in replacing the leaking core plug and at the same time replacing a rear crankshaft seal as the engine is dripping oil. Both jobs will require the engine to be lifted out of the car. Following on from the last blog post, the next day (Saturday) I took the Corsair for a worthwhile drive to Blandford as a good excuse to do a bit of shopping. 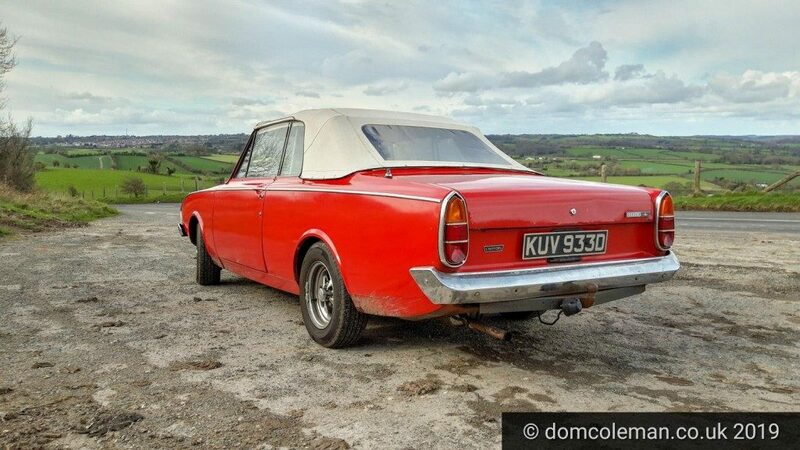 I was soon leading a line of cars through Melbury Abbas and then pulling up Spread Eagle hill out of the village at about 25 mph still with a long line of traffic behind me. As the car got to the top of the hill and then constrained by the road’s 50 mph limit, the Corsair settled in at 50-ish and I managed to shake off the long line of traffic behind as I cruised the straights and glided round the bends on the way to Blandford. Corsair engine bay – August 2018. Note new mechanical fuel pump that replaced the electric pump, the coil was also re-sited. Friday evening (10th Aug), I had just eaten my dinner and I get a phone call from John saying he was at the side of the road on the B3081 just before Zig Zag Hill and was I available this evening? The washing up could wait until I got home. 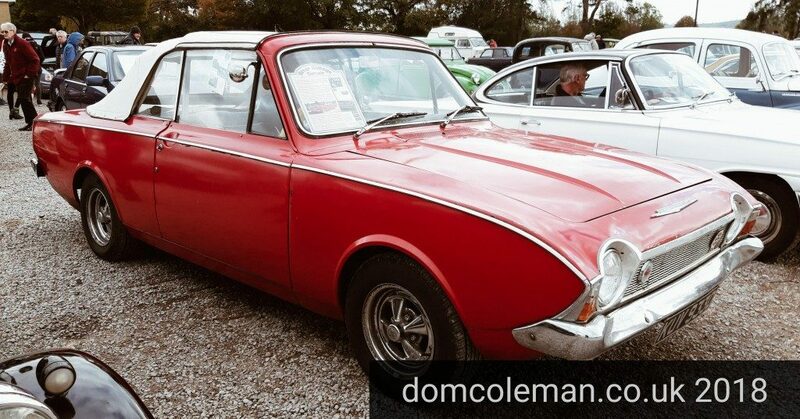 And no, he hadn’t broken down – there was plenty of that the day before, but John said the Corsair was running well and he had been out to Six-Penny Handley and back without a hitch or hiccup and could come over to pick me up in it. 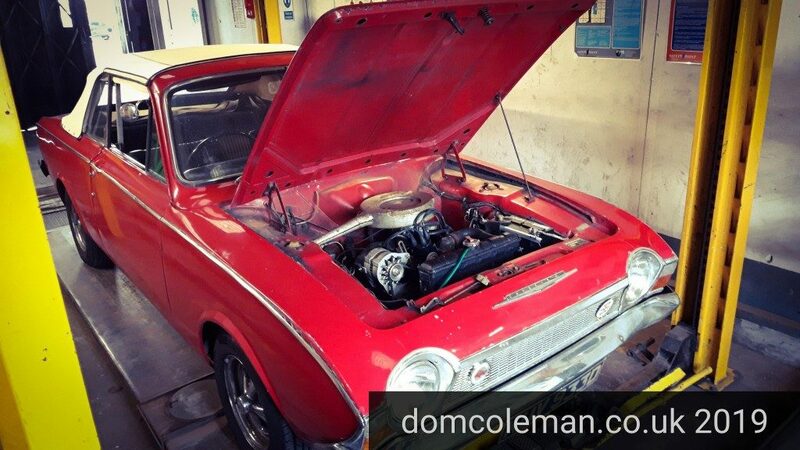 After collecting me and with John driving it back to his workshop, I could feel the car was running so much smoother, even as the passenger and it seemed responsive on the throttle. Once back at John’s, the Corsair was switched off with no over run even if the temperature gauge was, probably incorrectly, reading hot. John then went on to explain the shenanigans he had on the Thursday with it breaking down on him most times he took it out. It was as if the fuel system was being starved every so often and he thought it was the fuel tank not having a breather pipe (it does, as I fitted a new pipe with the recent tank re-install). He drilled two tiny vent holes in the filler can to help alleviate this, but still the problem occurred intermittently. He then noticed the over flow return pipe running back to the fuel tank had a leak, so he cut out the bad section and replaced with a section of pipe. From there the Corsair would continue to be starved of fuel but seemed worse on the next test drive, so he disconnected the return pipe from the carburettor running back to the fuel tank, and then the Corsair ran/drove normally. An overflow pipe had since been connected and re-routed to over flow away from the engine bay, but not to the fuel tank, for now. At least all seemed well with the Corsair. 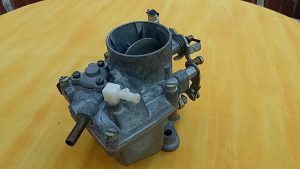 John said he had tuned it with about 10° Advance and with the new carburettor, the mixture screw now allowed for more finer tuning. 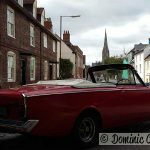 Test drives over the weekend beckoned but I had to have a quick cruise through the town’s high street before I took it home to put away in it’s garage. 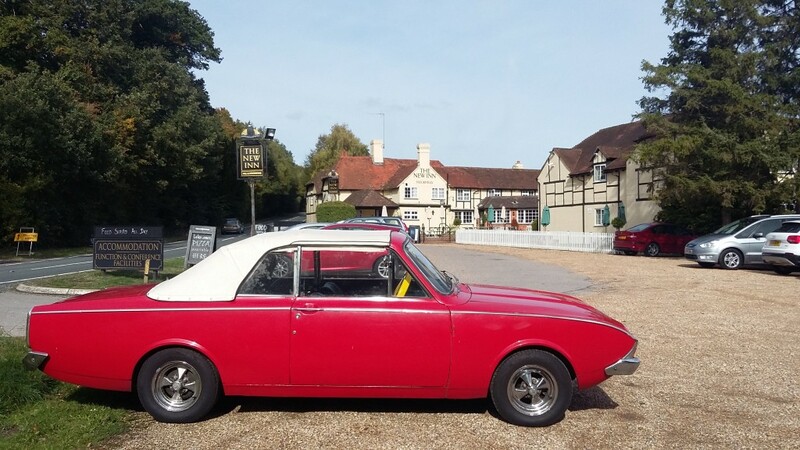 A few little jobs to do over the coming months will be to replace the flexible brake pipes as the bores of them maybe too small and possibly causing a temporary lock up of the brakes, as John experienced when the car was parked up. I’ve also to put the drivers window back in, now that John has also repaired the window glass runner utilising a window runner from a MGB. Since the tale of two fuel tanks and one breakdown, I did manage to get the Corsair to John’s (AJ Restoration) just and I mean only just. For the last half mile and going up a gentle hill, the car was reduced to chugging along at 5-10 miles an hour in first gear while I was waving on the stream of traffic that built up behind me. It was only so I could have a clear run up to John’s gates for it to stall and then roll the last bit to be left unceremoniously in the middle of his yard. That was early July and the arrangement was as before, to fit it in with his other bigger paid jobs. 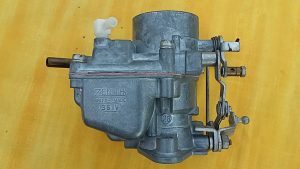 Around this time I decided to buy an new old stock (NOS) Zenith Carburettor 36 IV (3046) with a 28 choke from the Carburettor Hospital, based in Essex. The photos below don’t do it justice – the camera on my phone was struggling to digitally process the clean flat grey colour.